One viewing of Saskatoon Blades forward Lukas Sutter and any NHL scout or general manager would conclude he's a regular chip off the old block. In fact, when asked to describe the type of player he's been called, the 6-foot, 207-pound center said "two-way forward and agitator." Sutter's father, Rich, played 874 career NHL games spanning 13 seasons with seven different teams. In three seasons with the then-Lethbridge Broncos of the Western Hockey League from 1980-83, Sutter racked up 718 penalty minutes in 193 games. While Lukas fell far short of the numbers recorded by his father, he's certainly no stranger to trips to the penalty box. In 148 games spanning three seasons with the WHL's Blades, Sutter has totaled 352 penalty minutes, including 165 in 70 games in 2011-12. According to hockeyfights.com, he also got into 10 fights -- seven short of the 17 times he fought in 2010-11. "I don't think it's something where I go out of my way to [agitate], but I'm a physical guy and if guys get off their game because they're more worried about the way I'm playing, then I'm successful," Sutter told NHL.com. "I've always prided myself on being a team-first guy and it's not a thing I go out and look for, but if you have a teammate who gets run over or put in a bad position, then I feel I'll be one of the first guys there to support him and back him up." One of the players he fought in 2010-11 was former Red Deer Rebel Ryan Nugent-Hopkins, during a regular-season match Jan. 1, 2011. "We came around the net and he caught me with a high stick and I turned around not knowing it was him and just dropped my stuff," Sutter said. "Once you drop your stuff, you can't really stop." Nugent-Hopkins, who is a finalist for the Calder Trophy as the NHL's top rookie in his first season with the Edmonton Oilers, received a minor for high-sticking on the play. "I'm more your prototypical Sutter … the two-way, grinding center," Sutter said. "I'm in your face. It's probably from watching the way dad played. He told me that so long as I keep things simple, I'll be successful." Sutter quietly proved to be much more than an agitator this past season, and scouts have taken notice. He had 28 goals, 31 assists and a plus-15 rating, and he tied for second on the team with nine power-play goals. "Last year at the trade deadline, we brought in a guy like Brayden Schenn [from the Brandon Wheat Kings] and while my minutes were reduced, I got an opportunity to learn from the best player in junior hockey every day," Sutter said. "The knock throughout my career has always been my skating, and I think that's one thing I really tried to focus on and I think it has come a long way." Sutter catapulted from No. 86 to No. 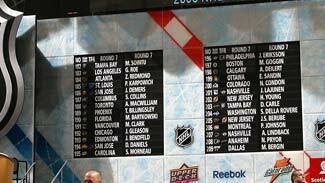 39 on Central Scouting's final ranking of North American skaters for the 2012 NHL Draft. "His stock has risen dramatically over the second half of season," Central Scouting's B.J. MacDonald told NHL.com. "Lukas has come alive offensively and is learning to become somewhat of a playmaker, as well. He's developed into a leader for his team and has become their heart and soul." Is there any added pressure knowing that he made such a dramatic rise in the rankings? "It's the same thought process I've had throughout," Sutter said. "You want to take it on and make the most of it, and as the season wore on, I think I grew as a player. The next month will be very exciting for me. I just want to sit back with my family and enjoy it." Based on his ranking, Sutter potentially could be drafted in the second or third round. But there are those who feel his value has skyrocketed so much that he could be tabbed as early as the first round. "He's good on draws and is responsible at both ends of the rink," MacDonald said. "He can be nasty to play against with lots of grit. He's tenacious in style and has the ability to get under opposing teams' skin. If that progression continues, he has the game to play as a top-six or bottom-six forward and be effective." Sutter, who first started playing hockey when he was 4 years old when his parents enrolled him in the Tim Horton's hockey program, admits he never was pressured into playing hockey despite the fact his father and five of his uncles combined for 3,000 NHL points and almost 5,000 games. "It was first nature, you grow up around it," he said. "It's not even that he pushed me … it was something I always wanted to do. I was growing up around the rink and exposed to it and it's a dream of mine to play in the NHL one day. " Sutter said his father's twin brother, Ron, the highest-drafted Sutter at No. 4 by the Philadelphia Flyers in 1982, is the one uncle he always looks to for advice. "He's the one I talk to the most and he's the closest to home, so if I ever want to hear a voice outside my dad's, he's the first person I'll call," he said. Sutter compares his style of play to center Dave Bolland of the Chicago Blackhawks. "He's a pesky guy but a consistent 20-goal scorer, so if I could ever play at that level, against the top lines every night, that's a good accomplishment," Sutter said. When asked what his response would be if an NHL general manager approached him to find out why he should be drafted, Sutter didn't hesitate. "What you see is what you get," he said. "I'm a hard-working guy. I'm not going to get away from my game to complement someone else -- that's what players see in me."